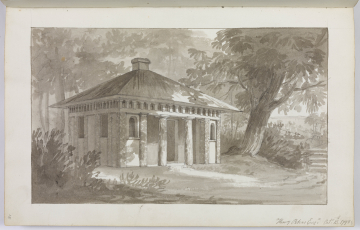 The Soane office Day Book records 'Mr Peters / Sketch in Book and / fair view of the Lodge / Betchworth / Gandy'. The sketch perspective is of the (as executed ?) design relating to drawings [23-24] and see also drawing . The office Day Book records 'Mr Soane / Sketch in Book and / fair View of the Lodge / Betchworth / Gandy'.